Turn yourself into a 1920s glamour puss with this stylish flapper fancy dress costume. Included is a sleeveless knee length black dress decorated with layered fringe detailing to the front and back and matching black straps. Completing the flapper fancy dress costume is a matching black headband decorated with a matching feather. The costume is also available in pink or red colours making it perfect for wearing alongside friends as part of a group fancy dress costume. 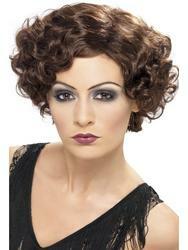 Sure to have you looking like the most stylish dancer at any 1920s or Moulin Rogue themed fancy dress party. Matching headband with attached matching feather.